Become a super hero and use your powers to get out of dangerous situations in Minecraft. Superheroes Unlimited 1.7.10 and 1.6.4 is a mod that allows you to make and use various costumes from several of the most popular superheroes. When using one of these costumes you become that character in the game and get your skills or powers. In all the mod account has 18 superheroes, these are some of them: Spiderman, Hulk, Flash, Superman, Robin, Batgirl, Batman, AquaMan, Deadpool, Thor, Iron Man, Wolverine, Nightwing and GreenArrow, among others. Each of them will give you powers. Although this current update does not have all the creatures mentioned, will be added in future updates. 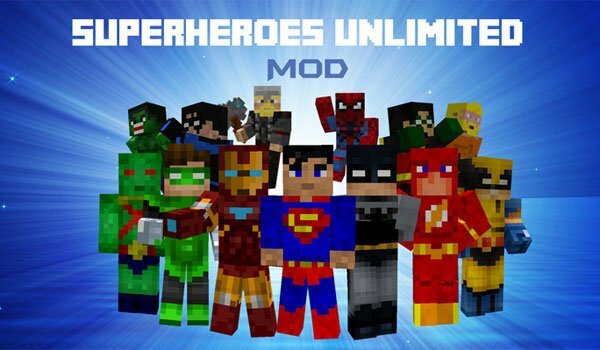 How to install Superheroes Unlimited Mod for Minecraft 1.7.10 and 1.6.4? Double click the Forge downloaded file, to run the installer. Adopt the powers of one of these super heroes in Minecraft!